Savour the enormity, drama and grandeur of the Namib-Nau­kluft Park, Namibia’s largest conservation area. With mountains, sand seas and riverbeds to explore, there is something for every adventurous spirit. Zebra in the Naukluft. Photo ©Paul van Schalkwyk. Hike the rugged gorges and paths in the formidable Naukluft mountain massif or test yourself and your vehicle on the two-day, 73 km 4×4 trail. Photograph some of the planet’s oldest and most peculiar plants on the Welwitschia Trail. 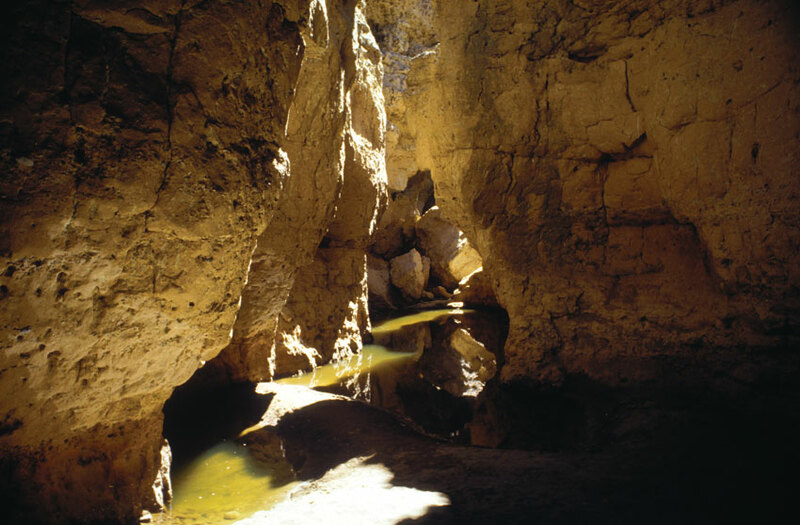 Explore the Sesriem Canyon. Gaze at a multitudes of stars and soak in the silence and solitude of the Namib Desert at night. Slide down some of the highest dunes in the world in the Namib sand sea (recently proclaimed a World Heritage Site). After summer rains, encounter large herds of gemsbok, zebra, springbok, ostrich and even giraffe in the northern section of the park. Go birding at the marine sanctuary, Sandwich Harbour, home to up to 50 000 wetland birds including spectacular flocks of greater and lesser flamingos. 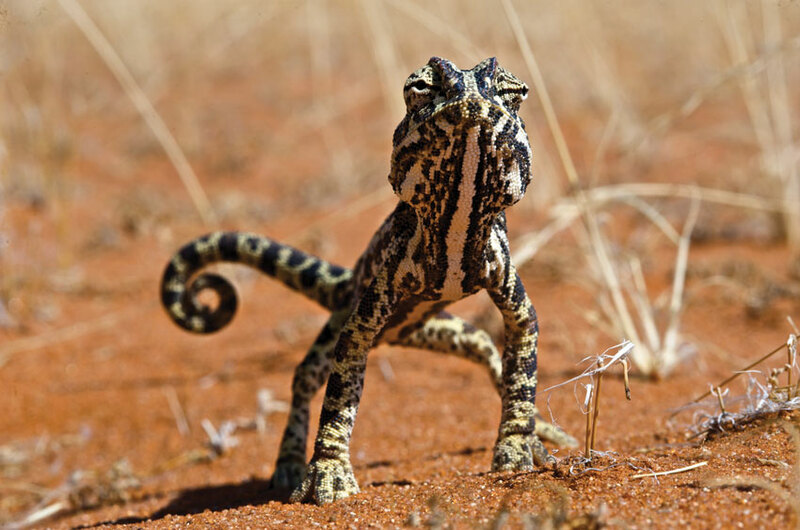 Desert chameleon. Photo ©Paul van Schalkwyk. Feel transported to another realm by the vast and inimitable gravel plains of the aptly named Moonscape. 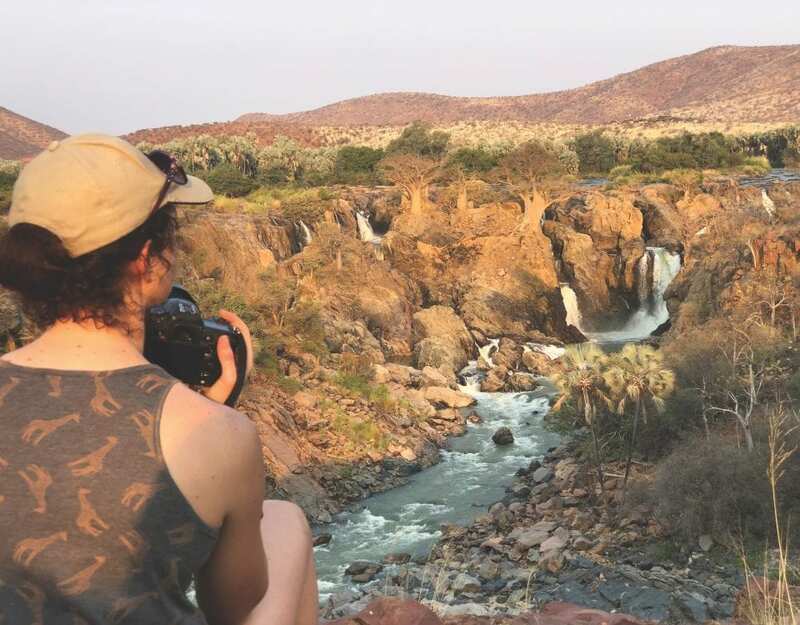 Explore the isolated mountains that are sprinkled liberally throughout the park, search for unexpected botanical treasures, and be rewarded by awe-inspiring views of the Namib-Naukluft Park. Contact Namibia Wildlife Resorts to make inquiries regarding rates and to make bookings. Rock hard and soft as flowing sand with rugged mountains and lapping waters, wet fogs and desiccating winds, Namibia’s Namib-Naukluft Park is a stunning study in contrast and extremes. Ephemeral rivers rage through canyons without warning, while baking heat dominates each day. Early morning and late afternoon sunlight paints the dunes in dramatic hues and shadows, drawing photographers like a magnet. During the heat of the day, mirages cast inselbergs into a sea of shimmering silver. The ghostly tracks of an ox-wagon cart gouged into gravel more than a century ago bear testimony to time, and yet the wind whips away a footprint on the dunes before another can be laid. One of the most intensely studied deserts on earth, the Namib section of the Namib-Naukluft Park is debatably the oldest desert on earth. But here life has adapted to the extremes in fascinating ways. Animals burrow in the sand and, when the need for eyes is proven unnecessary, they develop without them. Baboons go for months without drinking water, while the Welwitschia mirabilis plants live for more than a thousand years on these seemingly inhospitable plains. The Naukluft, which means ‘narrow ravine’, section of the park marks time in a more visible manner. Over time, rainwater cut through the rock and formed ravines. Today layers of igneous rock, quartzite, dolomite and shale are exposed on cliff faces and gorges. 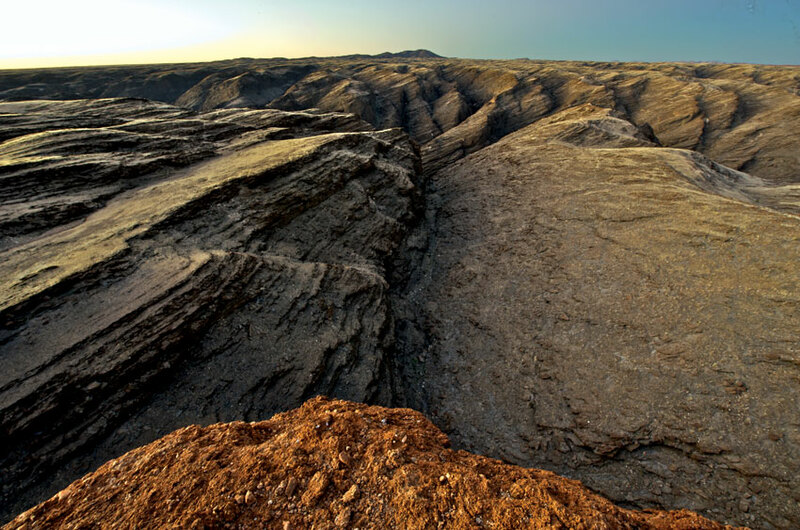 They are striking reminders of millions of years of calm and eruptions that mark the geological history of the Namib-Naukluft Park. Naukluft rock. Photo ©Paul van Schalkwyk. One of Africa’s largest protected areas, the Namib-Naukluft Park, covers almost 50 000 km2 and protects some of the most varied and extraordinary ecosystems in Namibia, the only country in the world named after its desert! 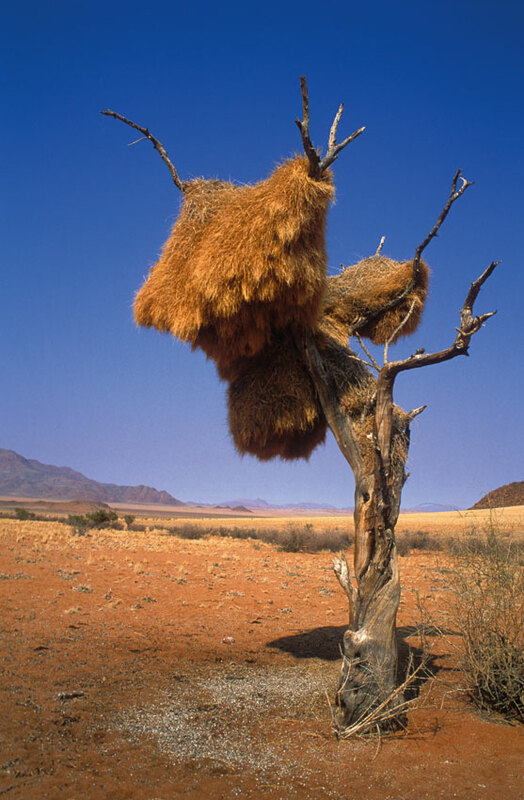 The Namib-Naukluft Park provides a sanctuary on a very grand scale to large mammals including black rhino (reintroduced to their former range in 2007 to mark the centenary of the park), Hartmann’s mountain zebra, giraffe, gemsbok, and springbok. Predators such as spotted and brown hyaena, jackal, caracal, leopard and cheetah are also protected in the park. Over 200 bird species have been recorded in the park. The Naukluft massif marks the southern-most range of many northern species such as Rüppell’s parrot, rosy-faced lovebirds and Monteiro’s hornbills. Mountain pools provide habitat for species not usually associated with a desert, such as African black ducks and hamerkop. The park is also noteworthy as a sanctuary for raptors such as black eagle, black-breasted snake-eagle, booted eagle, and lanner falcon. The internationally important wetland at Sandwich Harbour is a safe haven for tens of thousands of rare, migrant and resident seabirds. Desert plains, river washes and inselbergs are a botanist’s dream. 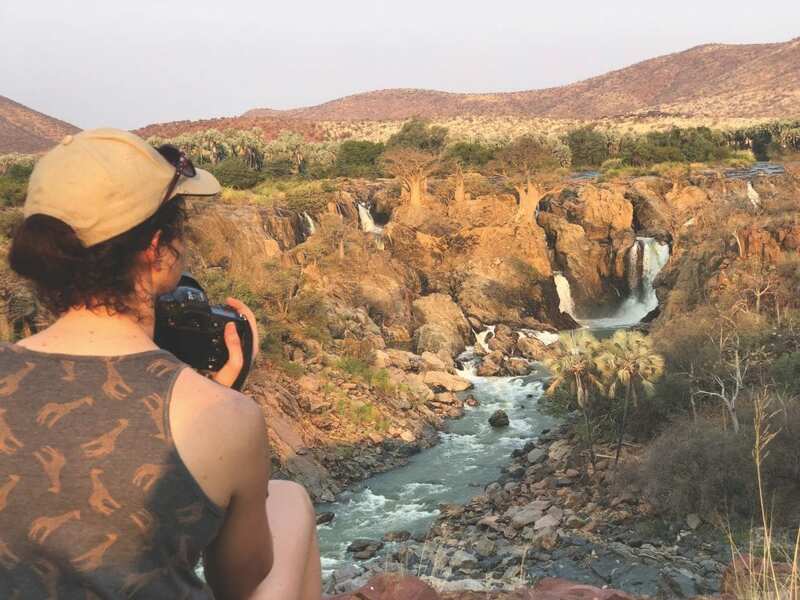 Succulents, lichens, seasonal grasses and plant species that may bloom once in the span of a human’s lifetime, offer intrigue and wonder to the Namib-Naukluft Park. Most of the Namib-Naukluft Park is currently uninhabited, but there has been a human presence since Early Stone Age man (Homo erectus) visited, leaving behind stone hand axes as evidence of occupation. The coast also more recently supported small clans of strandlopers, who lived off fish, birds, and other marine life, while the interior served as occasional hunting grounds for San and seasonal grazing land for nomadic pastoralists. Nama women at the Naukluft moutains. Photo ©Paul van Schalkwyk. European and American mariners, whalers, seal hunters and guano harvesters made use of Sandwich Harbour, one of only a few ‘ports’ in Namibia, attracted by the fresh water, safe haven from Atlantic gales and abundant bird life. Nama-speaking groups established strongholds in the Namib and fought German colonial troops in the late 1800s. Some scattered war wreckage still survives. Fearing internship by the British at the outbreak of WWII, two young German geologists, Henno Martin and Hermann Korn, hid in the Kuiseb Canyon for two and a half years with their dog, Otto, and a pet chameleon. Namib Naukluft Park – Sesriem. Photo ©Paul van Schalkwyk. An account of their Robinson Crusoe survivalist experiences can be read in Martin’s book, The Sheltering Desert. Today, roughly 300 Topnaar people still live within the borders of the park, inhabiting 13 small villages along the lower Kuiseb River where they raise livestock and harvest !nara melons. 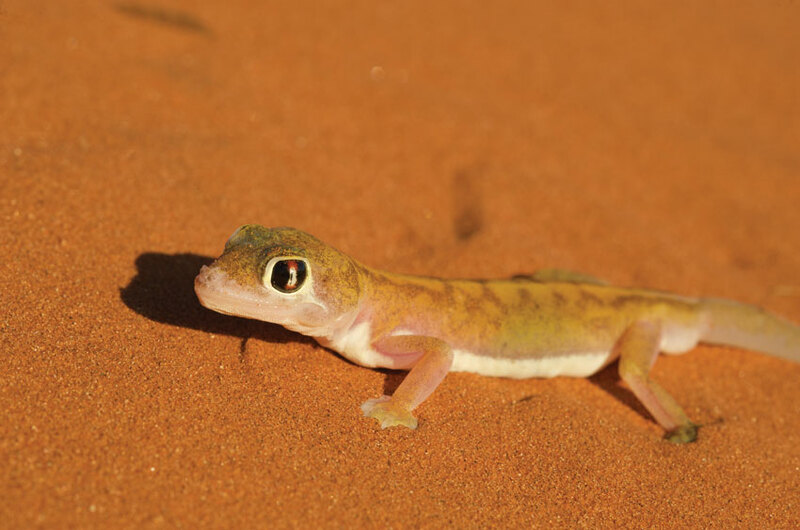 Palmato Gecko. Photo ©Paul van Schalkwyk. 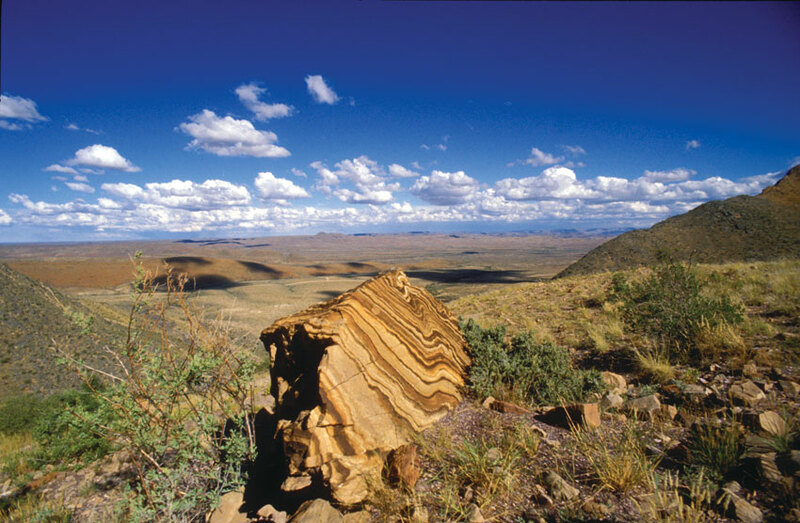 The Namib-Naukluft Park is approximately 200 km from Windhoek and can be accessed by many roads, major and minor. Entry permits for the Namib-Naukluft Park, including Sossusvlei and Sandwich Harbour, are required and can be obtained from the Ministry of Environment Tourism offices throughout the country or at Sesriem. Campsites have very limited facilities. These are mostly concentrated in the northern section of the park. If camping, you must be fully independent – bring firewood, water and food. Ample private accommodation exists on the periphery of the park, ranging from the modest to the magnificent. Namib-Naukluft. Photo ©Paul van Schalkwyk. Temperatures: Extremely variable. Days are generally hot (sometimes exceeding 40ºC). Nights can be very cold. Precipitation: Again, extremely variable depending on year and area. In some years no rain is recorded in parts of the Namib-Naukluft Park. 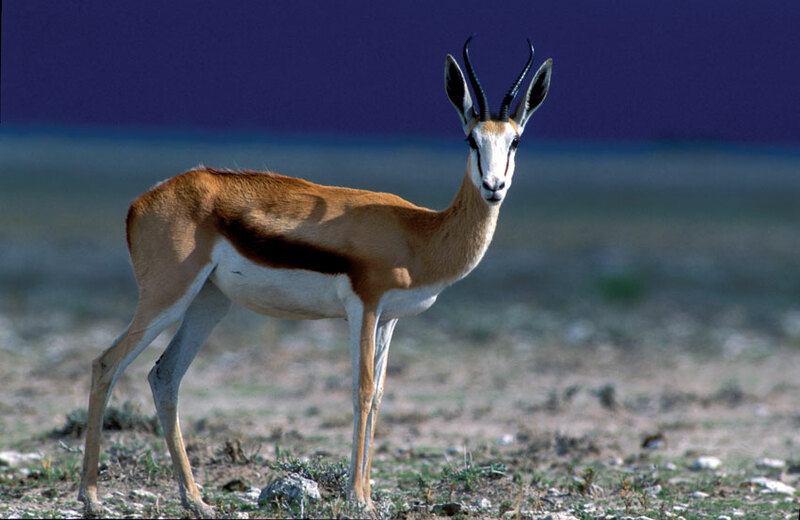 Namibia Wildlife Resorts – Contact Namibia Wildlife Resorts to make inquiries regarding rates and to make bookings.